-The 2516V4 DCT equipped with the Mitsubishi PLK-G head with double needle lock stitch, shuttle hook and thread trimmer. It applies any kind of pre-pressed patch pockets on jeans and casual trousers, army-pants and work wear. -The first double colour pocket setter worldwide created by Vi.Be.Mac. is able to sew with 2 threads in different colours in one sewing cycle. 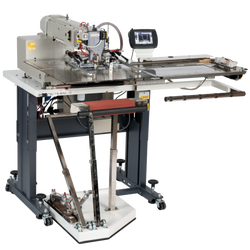 Also, this unti performs a variety of operations: apply pockets of any shape (round, square, with zip, asymmetric pockets), to apply labels, to make darts and pleats, flaps, labels, to embroider back pockets and patch cargo pockets. The patented loader-unloader system gives a full choice of pocket designs.The cost of moulds is the cheapest worldwide since they can be produced locally, otherwise, Vi.Be.Mac. will make it within 7 days. Thanks to the user friendly touch screen panel it is extremely easy to create any kind of pattern desired. By simply acquiring another PC software, it is possible to create your own design. Otherwise, you can always send a scatch to our pocket design department and have it ready within 24 hours, than download it on a flash memory stick and upload it onto the unit. The automatic pocket setter 2516V2, born in 1992, is a novelty on the market and since than none other sewing machine producer, except Vi.Be.Mac., has managed to satisfy the customers’ requirements for a change of style, fashion and production. A short delay in launching its own pocket setter gave Vi.Be.Mac. the chance to develop the unit that is able to offer altogether: flexibility, high productivity, easy exploitation and low running costs. One of the keystone characteristics of all Vi.Be.Mac.pocket setters are low running costs of the unit. The pocket moulds can be produced locally by the official dealers or directly at our customers factories. The innovative characteristics together with the exclusive loader-stacker system guarantees the incredible levels of productivity and quality. ​Also, the successful collaboration with Mitsubishi (Japan) has resulted in another excellent machine: Vi.Be.Mac. presents a new double colour pocket setter, 2516V4 DCT, developed in order to satisfy the fashion needs of all the top world buyers. -Sewing Head: Mistubishi PLK-G30 MAXI Vi.Be.Mac.